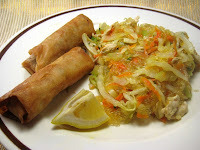 Somebody posted a picture on Facebook the other day of a plateful of pancit bihon, and I had been pining ever since. The picture was so clear it was as if the plate was right there on my desk instead of shown on the LCD monitor. Today, at lunch, I chanced upon freshly cooked pancit among the offerings at the cafeteria; and I thought I would finally satisfy my craving. I did. Can somebody please name a Filipino family that does not cook pancit? There is none, believe me! It is said that just about every Filipino has at least some drops of Chinese blood running through his veins. Hence, our fondness for noodles which – it does not take a genius to figure out – were brought to our ancestors’ attention by Chinese immigrants. I just Wikipedia-ed it: pancit is from the Hokkien pian i sit, or something cooked conveniently fast. The pancit is as ubiquitous as any Filipino food can possibly get. Despite its Chinese origins, it is as Pinoy as adobo or tinola. You can order it from the humblest to the poshest restaurant; perhaps as an afternoon snack or the main meal at lunch or supper; and it is certainly an ever present when somebody is celebrating a birth anniversary. My Mom, probably hearing it from her half-Chinese mother – and, therefore, my grandmother – would always insist that there was pancit when one of us was having a birthday. Better if it was sotanghon, the noodles of which she would not cut – the strands of the noodles daw were symbolic of life itself. Having the noodles of the sotanghon long, therefore, was akin to wishing the celebrant long life. On ordinary days when we were just having pancit bihon for lunch or supper, there would be fried chicken or lechon kawalî to go along with it. We would do away with the rice because the pancit went perfectly with either ulam. Apart from these I have already mentioned, there are other variants of this Pinoy favorite. Pancit lomi is just referred to as loming Lipa here in the city; this is to distinguish it from the pancit lomi done elsewhere which has the dreaded gulay. The loming Lipa, as everyone knows, is legendary in its fame. It is the great status equalizer that not even Karl Marx thought was possible. In a lomi haus, you will find owners of Mercedes Benzes sitting next to tricycle drivers eating the same thing. Then there is the pancit langlang. As the name suggests, it is noodles with some onions, shredded meat, some chicharon and just about nothing else. It is as frugal with recado as pancit can possibly get; yet, the langlang is just simply divine! If my Mom would combine the miki with the bihon, others would try different combinations of noodles to make a pancit. Sotanghon is fine by itself; but I have tried pancit that had the sotanghon mixed with bihon. 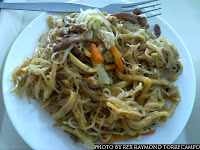 Pancit Canton is also quite excellent as it is; but there are also those who mix the Canton noodles with the bihon. The pancit is called – at least hereabouts – as the Canton at bihon; and you had better be very deliberate when you say that and never – as in, NEVER – ever make a contraction of the words Canton and bihon. 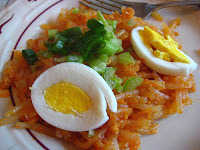 There are so many other variants of this Filipino favorite; and often the name of the variant gives away its most probable place of origin: pancit Malabon, pancit Morong or pancit Tuguegarao, to name a few. As I wrote earlier, the pancit is just about as ubiquitous as it can possibly guess. You take it so for granted – until you cannot get any! When I visited the Bay Area for a fortnight almost a decade ago, my hosts took me with them to dine at this Chinese restaurant named Kenny’s. Now, what point was there in going to a Chinese restaurant if one had no plans to order noodles? Indeed, the waiter soon brought in something that very vaguely resembled pancit. In fact, the noodles looked and tasted more like Italian pasta than anything that the Chinese ever invented. I know I was only there for a couple of weeks, but never in my life did I miss pancit so much as I did that night at Kenny’s! It was only then that I fully understood why one of my hosts – who was assigned here in the country in the sixties and who learned to eat much of what we ourselves eat – orders pancit almost as soon as he gets out of the international airport in Manila every time he visits. The guy is American, by the way. The pancit in the Bay Area was just not pancit at all!